Does he look like a hunter? 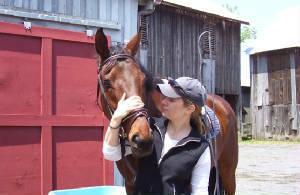 These photos are at our new barn, Edgewood Farm, in Upper Marlboro, MD - taken Sunday, May 13th, 2007. The photo above was my favorite from the day....but below I'll put the photos in a chronological order. I started him off over a crossrail with 'trot poles' (the poles provide training/guidance for a green horse - they force him to put is feet in the proper place in front of a fence.) 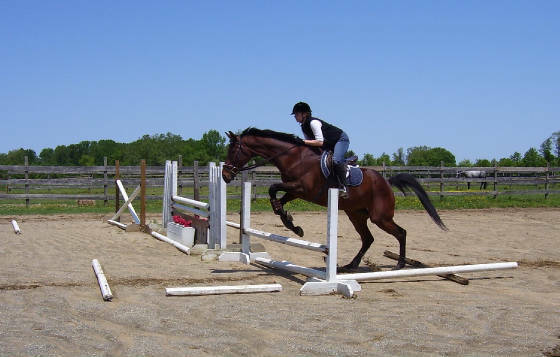 We would trot into the jump, which is a slower and more controlled approach that helps Thunder figure out where he should learn to take off from....and then we moved up to a vertical with the poles (still using the trot poles and trotting in), and then we removed the poles as he took the fence at a canter in both directions. 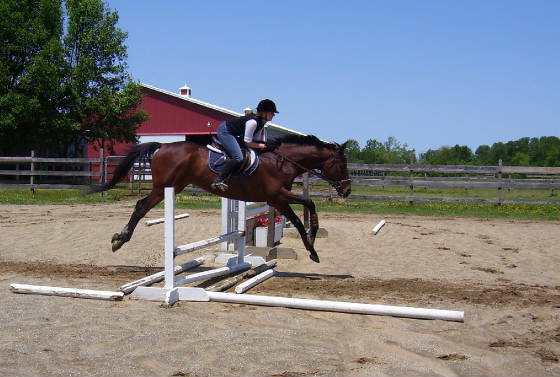 The photo above was taken after the poles were removed and he was at a solid canter approach. My position over the fence isn't perfect, but this was the best photo of Thunder. Words cannot express how proud I am of him - he was AWESOME. Warm up on the lunge line. Warming up at the trot before we start jumping. His first try at the crossrails. 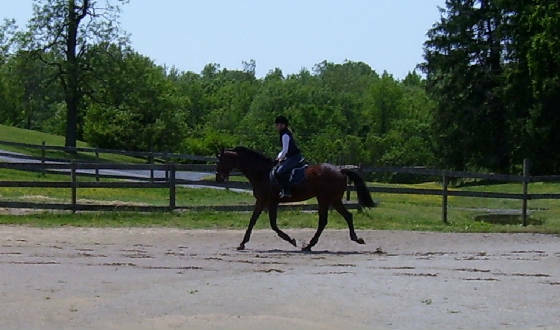 Notice the trot poles leading in and out. You can see in the above photo both the trot poles for guidance (lying parallel in front of and after the crossrail) and the actual crossrail, an obviously easier and lower fence than a straight rail. 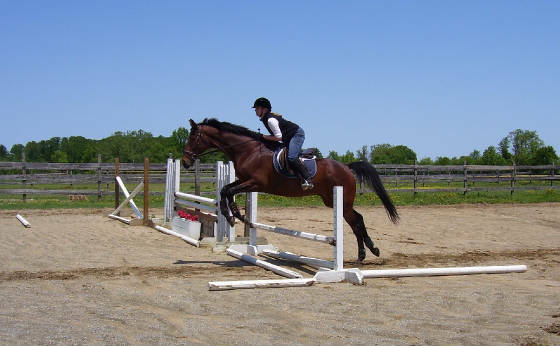 We also put perpendicular rails down in front of and after the jump to help teach Thunder to approach the fence and land after it in a straight line. This photo above was Thunder's first try at the fence. 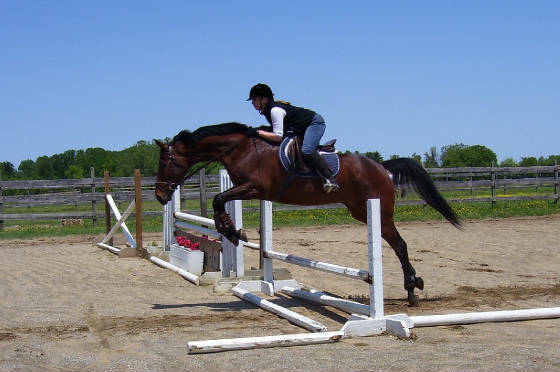 I'm a little forward on him because I was braced for a big springy leap, and I got what I was anticipating! In the photo below, Thunder has traversed the crossrail with trot poles a couple times and he's much more comfortable and in proper form. Learning to handle the crossrail jump. At this point he was taking it like a pro. Thunder's first attempt at at the straight rail. Look at his expression - he's concentrating hard! 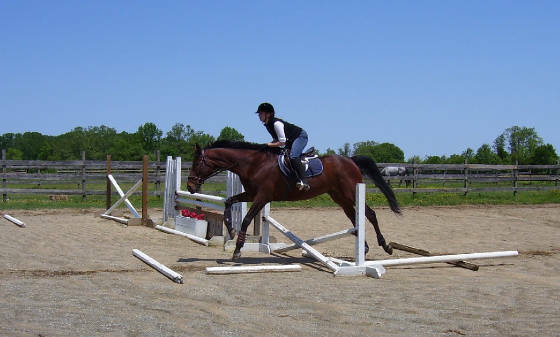 I love this photo because even though he clearly looks awkward and is still in his learning phase, his expression says it all - he's looking at the exit pole on the ground and concentrating hard on where to put his feet. 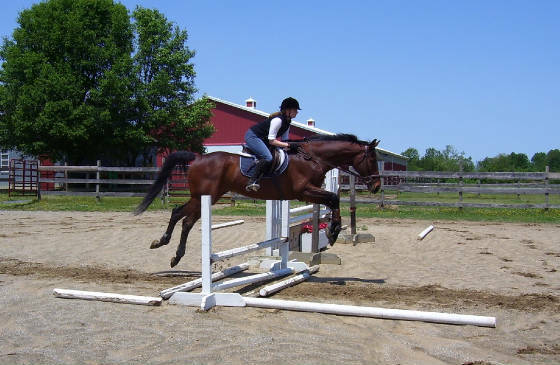 We trotted up to this fence (which you have to do when you use trot poles) so his forward momentum was limited by design and that's why he's so coiled up. He paid attention to the raised height and put a lot of spring into the back to clear it. It doesn't make for a pretty picture but it documents his progress nicely! 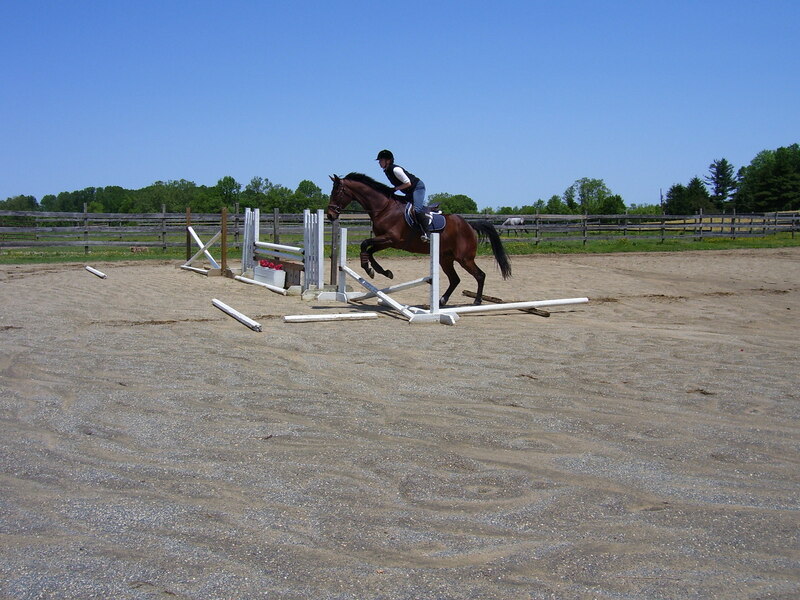 Below, we had just removed the guide/trot poles and I have brought him to the fence at a slow, even canter. He got a little too close on takeoff here (compare it to the photo at the top, where he left in the perfect spot) and he needs to bring his knees together - but he's picking it up at this point by leaps and bounds with every loop around. Canter approach, guide poles removed. 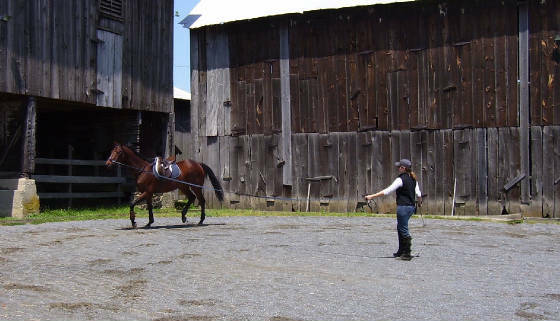 One thing you horsemen will notice - at this point he knows he's about to circle right and this is a great shot because you can see he is responding to that by picking up the correct lead on the landing!! Thunder, on the landing side of the fence having just reversed direction. "By Jove, I think he's got it!" A SPECIAL THANKS TO BARBARA FOR TAKING THESE PICTURES! !